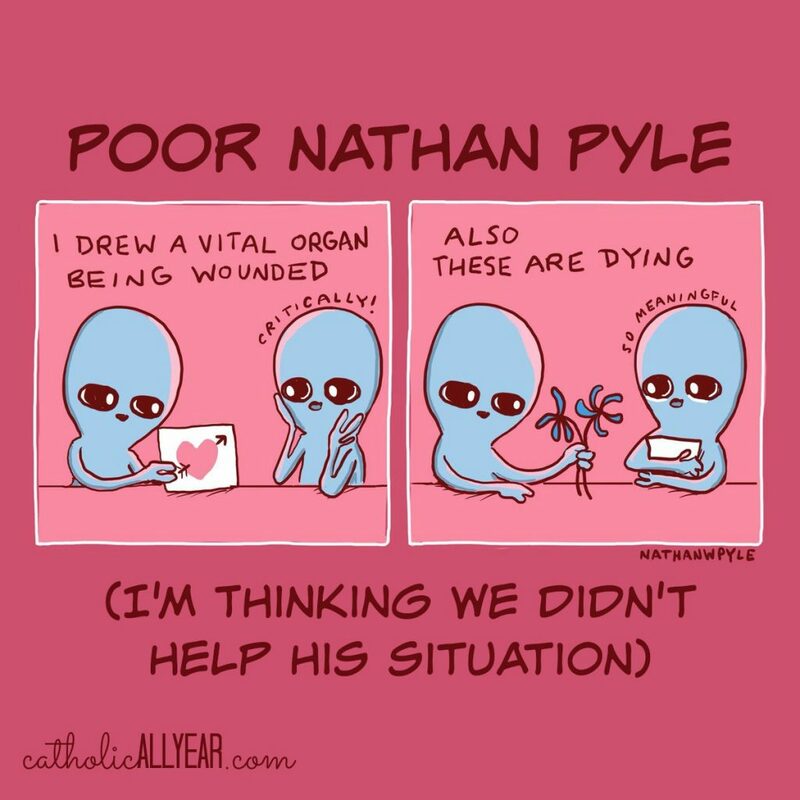 Nathan Pyle is the creator of a comic called Strange Planet, in which blobby aliens do regular people stuff and describe it in unusual ways. It’s gentle and amusing and, until very recently, utterly uncontroversial. The comics are simple and shareable and Instagram-ready and Mr. Pyle has amassed a substantial social media following on both his professional and personal accounts. He shares his drawings. He offers to sell you t-shirts and iPhone covers. There are occasional glimpses of his family, but his captions are almost nonexistent. His personal profile notes that he follows Jesus, but otherwise his focus is clearly on sharing his work, rather than his opinions. But THEN, gasp, someone discovered that in 2017, he retweeted his then-girlfriend’s tweet from the March for Life and expressed happiness that she had been born. Said person retweeted the old tweet, so did many thousand other people. 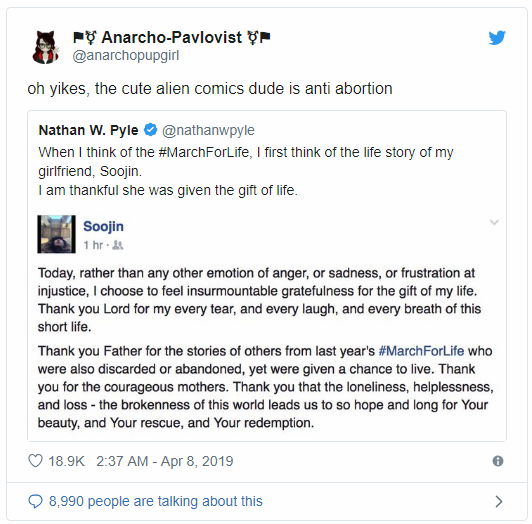 His feeds were suddenly filled with shock and condemnation from pro-abortion-types, and articles were written encouraging people to stop sharing his comics, because how DARE he have an unpopular opinion. My facebook feed, on the other hand, was filled with anti-abortion-types pointing out how ridiculous it is that so many people would turn their back on something they enjoy and/or would attempt to damage someone’s ability to make a living because of a difference of opinion on something unrelated to the work. I agree with their point entirely. Buuuuuut . . . where do we think those guys learned that? It seems to me that people who are against abortion are awfully vocal about refusing to interact with or do business with people and companies reported to support abortion. I was sitting down to write basically that exact post again, when I remembered I had already written it. And made a cute little graphic for it and everything. So, take a sec and click over there and save me some time. For the record, and as usual, neither side seems as interested in getting it right as they are in getting it fast and frantic. I just do not believe that boycotting and/or trying to DESTROY people with whom I have a difference of opinion — even on something really important — is a good tactic. We Christians are again missionaries in a pagan land. We could be the ones to set the example online and in real life of charitable discourse and of friendship in the face of opposing viewpoints and of knocking it off with all the punitive boycotting already. And we could agree to enjoy the silly comics . . . together. And someday we might get the chance to have a conversation about the important stuff. But maybe that’s just a dream imaginary pleasant nonsense. I could never understand not voting for someone based on this one issue. There are so many other issues of importance to the sanctity of life as well. Love these comics! Also completely agree re:boycotting. Not my fave evangelizing strategy. Thanks for fleshing out exactly why it just makes me cringe. I had a hard time pinpointing why. Hi, Kendra, I’ve been fascinated by your blog for the past months and I thank and applaud you for your empathy. I was baptized as a child but had never had further contact with Catholicism or any other religion. 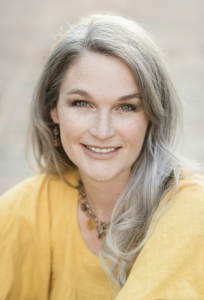 Your informative, non-judgemental and truly inspiring blog has motivated my ongoing spiritual and religious search, for which I cannot thank you enough. I will pray for Jim and your family tonight. Thank you, Gabriela. I’m glad to have you here! This was also my take-away from Unplanned. Abby johnson lives ‘love your neighbor’ so well. I never thought the day would come where I disagreed with you on something! ☺ Why would you knowingly give your money to a company that donates to Planned Parenthood? I understand we have to live in the real world and can’t spend our days boycotting everything we don’t agree with! But, if more of us prolifers boycotted these companies, they would see their profits decrease. Less profits = less $ to help PP kill babies. I don’t see a problem with that! Then we have to accept when it happens to us and to people we love. And we can’t be surprised when the divide between people of different “opinion groups” just keeps getting deeper and wider. It’s not what my informed conscience tells me is right. But you have to follow your informed conscience. I admire you & your public voice for many reasons. But I cannot agree with you on this topic. I cannot enjoy a Starbucks coffee or a Disney gift for my child or many other purchases knowing that I have financially supported the the wounding of a mother and the death of her child. Lessening this evil in the world by voting with our wallet enables us to make a difference. Chosing to boycott is being active for good. Why put money in abortionists pockets because we are afraid of being boycotted by others? Thank you for commenting, and even though we don’t agree, I think it’s really great that we can participate in a civil discussion about important issues. I admit I’m not good at keeping up with boycotts. However, I think boycotting in this instance goes beyond a “difference of opinions”. I probably wouldn’t bother boycotting a company that supports gay rights just because they have a different opinion….but abortion is actual murder. Second, I think MLK and Ghandi would beg to differ about the efficacy of boycotts. No, I don’t think boycotting is as effective as supporting care houses for mothers/children or even as effective as prayer but I do think it can play a part in the fight against the holocaust of our time. I know. And abortion does feel particularly time critical, since babies are dying and mothers are being wounded RIGHT NOW. But boycotts and shunning just haven’t seemed like an effective way to change hearts and minds. Changing individual PEOPLE is the way to change the culture, right? And how can we do that if we put up a wall between us and them? AMEN! I mean, (I wish I could increase this font) AMEN! I have long believed that often the most detrimental voice in calling people to Faith is the hateful voice of Christian judgement. As a Believer I cringe when I see a person with a picket sign “Sinners go to HELL!” I have no desire to come to that person and hear more of that message. (Except for the wish to tell them that sinners also get to go to Heaven ‍♀️). Why couldn’t the sign simply read- God is Love? Come to me all who are weary and burdened”. Our world is SO weary and SO burdened- and the ‘Golden Rule’ so often tossed aside. 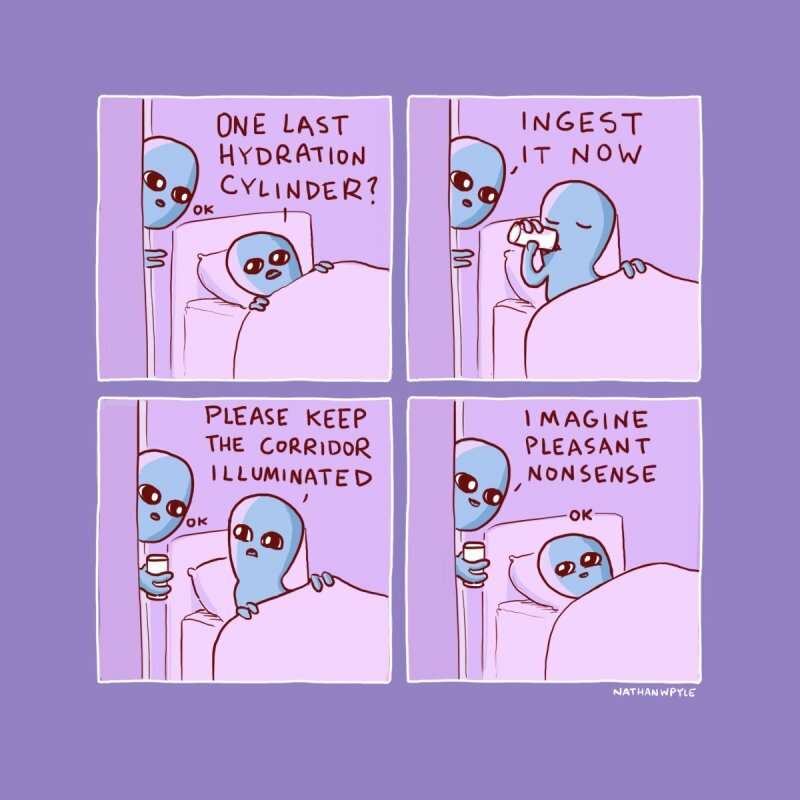 I really loved and appreciated both of your posts (old and new) and I also think that Nathan Pyle is wonderfully silly and I enjoy his comics. I think your sign would be much more effective! Cute comics. I am very out of the loop on media things, so there might be a subtle nuance that I am missing, but I am not sure that I entirely agree with your conclusion. I don’t think as an evangelization technique boycotting makes any sense (with the intention of destroying a company or person? : not going to win any favors with them). However, I do think that one ought to be cautious with what he supports with his money–perhaps some might call that boycotting. Especially in a capitalist society it is important for me as a conscientious consumer to avoid (where reasonable and possible) even remote material cooperation with evil and formally cooperate with good whenever possible. It isn’t about the personal opinions of the CEOs in that case, but about what my money is supporting. If I need some coffee and I can choose between a company that supports _____ (insert questionable policy) with their profits or one that does not, I will always choose the latter. I guess it’s just the mentality that concerns me. The idea that “we” don’t go to Starbucks and “they” do. “We” won’t go see movies featuring one actor and “they” won’t go see another. We have to make informed decisions, of course. We have to pick the right environments and entertainments for ourselves and our families. But the echo chamber effect is so real. Maybe it starts with abortion, but you can also see it between Catholics who identify as traditional or progressive, and don’t even want to interact with each other. It’s just avoid and unfollow and only discuss issues with people who share my viewpoint. That’s where it feels like all this is heading. Man, I just do not agree with you on this topic, in the least. It’s hard, you know, the stakes are so high…abortion is murder…and yet, well intentioned Catholics use your blog posts to justify their Starbucks. It should make us feel sick to our stomachs to hand over our hard earned money to Target or Starbucks or Johnson and Johnson, or any other companies that are blantantly supporting Planned parenthood and other aggressively anti-life/anti-family agendas. So sick that we go out of our way to seek other alternatives. Its not that hard. From handyman to fresh brewed coffee, to big box stores. We always have a choice. THAT is what I am teaching my kids. It doesnt hurt anyone to simply say , “I love you but I cannot suport your business practices.” And the only way we can remove our support is with our dollars…whenever we can…even if its just 10% of the time. Its that simple. Not because it hurts them but because it changes US! It makes us more mindful, more purposeful, more aware, more informed! These companies and corporations dont just support PP, they support insidious “charitable” programs in third world countires that are spreading the virus of abortion and sterilization all over the world. And somehow we have convinced ourselves that removing our 3.50 here, and our 50 bucks there is just not worth it and in fact doing so is …mean? Or talking about it on social media is mean? Or…what…using hateful language to talk about it on social media is mean? Well, that last one I can agree with. I just think this topic needs deeper reflection. I would challenge anyone who reads these posts on your blog to discuss it with more people. Don’t just nod your head and say, “that makes sense,” because its coming from a favorite Catholic blogger. Read more, read opposing views to this one. And then read even more. And pray. A lot. Thank you for your thoughtful comment. I just think we are approaching the same issue from well-intentioned places but with different focuses. My feeling is that if boycotts changed people’s minds, we should definitely do them, but I haven’t seen evidence of boycotting or shunning creating conversion. Financial threats just don’t have that potential to really change how a person sees an issue, I don’t think. I don’t agree with you. What are we saying to Poor Nathan Pyle when we give our money to causes and stores that would have aborted his girlfriend? What do we say to our children when we give money to companies that support abortion? God gave us our money; we spend it prudently. We are not trying to DESTROY anyone but buying coffee at another shop is no big deal. Then our pennies don’t go toward taking an innocent life. And there is something heroic about what he did. He knew he would face backlash but he stood pro-life anyway. Boycotting and outrage isn’t a new phenomena; he knew what he was doing. Good for him–may he be supported all the more on Earth and gain reward in heaven. Really, I think you should take this post down. Abortion is murder. We shouldn’t materially support the murderers. And a previous commenter is right–people will use your words to justify a cafeteria Catholic mentality. God calls us to more. But here’s the thing, it’s entirely unclear what Mr. Pyle’s actual position on abortion is. All his clarification tweet did was bag on Republicans. But I honestly don’t see that as a reason for either side to shun him. Pray for him. Have a conversation with him if you get the opportunity, but how will boycotting his comics change his mind either way? But if he is or isn’t, I stand by the position that if people come out publicly to say their position, they know what they are getting. And I have little respect for someone who plays both sides as it seems he is doing. Don’t give your money to Planned Parenthood–whether through a direct donation or Starbucks. There is a hierarchy in Catholic social teaching. There is a difference between just wage and abortion. I don’t yet know where I finally stand on this issue, because I feel like I have heard good input on both sides, and I appreciate that you’ve weighed in with your carefully considered opinion on it. I think it’s interesting that at your link on the Truth or Fiction website they updated it with a recent tweet from the artist in which he responds on this issue. I won’t quote it here, but it would have made more sense to me had he just had his first sentence but not gone on to make it a political issue. That seems to me to be an immature understanding of the critical issue of abortion, which has nothing to do with separation of church and state or a political party (I mean objectively, regardless of how it plays out in the national debate). One does not need to vote for a certain party or believe in a certain religion to know abortion is wrong and not the answer to the many difficult social issues that can give rise to an unplanned pregnancy. I at times will try not to directly support an organization with my dollars (choosing a different store if it’s possible and reasonable) if they have openly and brazenly put their moral or social agenda front and center and I disagree with that agenda. But practically speaking I still may occasionally buy things from them; it depends on the store and the issue. If the issue was abortion I would certainly think seriously before supporting them. This leads me to a related question (Danger! Potential can of worms opening! ): I’ve seen people say they will boycott the movies of actors who openly opposed Georgia’s heartbeat bill and signed a letter saying they would pull their working dollars from the state if it passed. What say you on that sort of thing — a boycott of a boycott, so to speak? I know! His clarification tweet didn’t clarify anything except that he’s not a fan of the president, so now what will all the Trump supporters who jumped on his bandwagon yesterday do?! My personal opinion is that for comics, actors, movies and tv shows, etc, I just try to judge the individual creation on its own particular merits. Two movies that I think have amazing Catholic heart and merit (one that isn’t overtly religious, one that is) were made, one by an adulterer and one by a heretic, but the movies themselves are good and profound. It takes a lot more work. I do a lot of starting shows and quitting them, and a lot of previewing of movies that I don’t show my family or recommend here. But that’s the approach that seems to me to work the best. Well now you have me really curious what those two movies are. Haha! Thanks for the additional thoughts and reply. It IS hard work to discern those things for our families. Exhausting sometimes! I’m pretty sure she means Mel Gibson’s The Passion of the Christ, for the adulterer, I’m not sure about the other one. I don’t know how I stand on this: I don’t believe that yelling and threatening have (or will ever be) effective in changing hearts. For me the decision to buy or not from a certain brand depends on how easily I can find a substitute of the product and how they support the cause I don’t agree with. For example, this year Mac Cosmetics will financially support one of PP sexual educations plan (apparently an app that provides “informations” to teens and young people). We know what kind of informations they provide, and to the most vulnerable, young people. I could have accepted they making a Facebook post celebrating gay marriage or something like this, but I feel this is different. Also, in other occasions I don’t boycott a brand strictly speaking since I don’t send them any email or message informing them that I’m not buying from them anymore, but if they stand for causes that I strongly disagree with (Es. Abortion), I found that I just find myself drawn to other brands. I’m with you. Boycotts are not useful in this way. It doesn’t even impact anyone financially because for every one person who’s never going to Disneyland again or never having another Starbucks there’s another pro choice person that’s going to deliberately spend their money there just because you won’t. If you want to make an impact give to a pro life organization, put up a sign, get a bumper sticker, pray at an abortion clinic (or have more than 2 kids which will somehow set off their crazy pro life Catholic radar ). These boycotts don’t promote dialogue or change minds. Not trolling here. I’m honestly grappling with this of late and have long been similar in thought with you, especially with corporate donations and corporate matches (I don’t want someone deciding that my match to a Catholic org shouldn’t happen because the organization is Catholic). I would appreciate your thoughts on isolated/particular company campaigns. For example, I use a certain (not-to-be-named) popular cosmetic line from a fancy makeup store. During a fixed timeframe (in one case 2-years, in another it’s one month) purchases of certain products, shades, or fees will be given to Planned Parenthood. With one company it’s 100% of the funds generated! One company hopes to raise over $6 million dollars this year alone from this campaign. I had considered switching makeup lines completely, or avoid making purchases during the campaign period. It’s hard to stay on top of this as these efforts come-and-go, so I thought that I would just switch completely; but I have no idea nor do I want to go down a rabbit hole to start researching every company. On the other hand, it seems that a particular campaign that is so targeted and marketed is very cut-and-dry, and I don’t want to participate or support that kind of company. Yes, it’s definitely a complicated business. I would want to avoid making a purchase during the campaign period, but I wouldn’t necessarily quit shopping there entirely. Such a public, devoted campaign does give one pause, though. It’s crazy times. I guess it would be good if you can know when your purchase would be going to that cause and when it wouldn’t? I would ask myself: “Am I okay with buying expensive make-up (which is only used to make myself prettier) when I know the company is doing these campaigns and directly contributing to Planned Parenthood and all it stands for?” I know comments sometimes come out as sounding rude because we can’t hear or see the intent behind it, especially in these sort of topics. I am not trying to make you feel bad, but it seems that for such a product (unnecessary), you could switch to another company entirely. As you said, you do not want to go down a rabbit hole and start researching every company, but you already know about this one. I find that involving my guardian angel in everyday things helps me out a great deal! God Bless. Thanks Maria. I appreciate your comment and agree that comments online can often feel harsher than they are. I am in strong agreement with you on the “you already know about this one” referring to the company/product which is what I was thinking along the lines as well. What I don’t see eye-to-eye with you is about makeup only being used for making oneself prettier. Makeup, which does enhance beauty without a doubt, is also very practical for me. I have a malformity which causes many people to stare at me, ask inappropriate questions, spread gossip, and not see me for who I am. The right type of makeup literally covers what I need covered, and unless someone is standing very close to me, the problem cannot be seen. And while I would never wish or say that makeup is the reason for my self-esteem, I do feel more confident going out, speaking with others, and looking people in the eye. I 100% agree with you. And for the record, I don’t, always, but I always enjoy reading about your life, your faith, your family, and I often learn something from you. It’s one of the only reasons I read your blog – in the traditional Catholic Church, we were the scholars, the philosophers, the scientists – God gave us these brains and we’re not reaching anyone by closing off discourse. The thoughtless parroting of anything is never going to be compelling to me, and I suspect I’m not alone in that regard. Keep on keepin’ on. Prayers for your whole family as you walk through this challenge. I appreciate your perspective, Kendra! I love how charitably you’ve handled this whole issue and find it very inspiring. Your blog helps me on my faith journey SO much. God bless you & that beautiful family of yours! There is a distinction to be made here. It is, in my opinion, a good use of our resources to boycott *corporations* (Target, Starbucks) who support the abortion industry. By doing so you are not necessarily going to be affecting someone’s livelihood, in that these companies have millions of customers and the loss of your business is not as detrimental to their bottom line. Plus, these corporations often donate tens of thousands of dollars every year to pro abortion groups, and we must be wary of the effect our business will have on this practice. However, I completely agree with Kendra that boycotting a small business owner (as in the case of Nathan Pyle) whose bottom line will be greatly affected by the loss of your business, and who is likely not donating much if any money to the pro abortion industry, is not an effective means of evangelization.